The holiday season has begun and it truly is a magical time of year where friends gather, and celebrate…..which is a reminder the W.C.A.H.S. “Dreams Do Come True” tree of light celebration is this Thursday, November 30th at the Spooner Market & Grill from 4pm-7pm. Last year was the first year they ventured away from the shelter and what a great event it was. 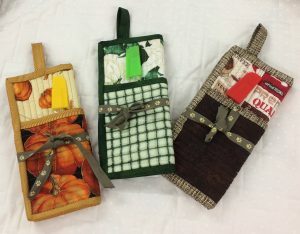 It’s a great fundraiser for the shelter and at Thimbles the ladies have been sewing up bushel baskets of pot holders. They are so, dang cute. So if you can come and enjoy the fun. Those that missed last year were truly disappointed. And the sale at Thimbles continues…..lots of great deals to be had, so if you’re out and about, stop in and check it out. I have one last Taylormade table in which is the floor model at a great price. So if you are wanting a new sewing table, there’s no better time than now. A great gift idea that is simple and quick to make for that last minute movie buff….. A runner to go with that bowl of popcorn watching your favorite on a snowy winter night. We have kits. Enjoy this week. The weather is going to cooperate with shopping plans…so head out and while you’re out, stop in. We’re always popping something!